Have you been dominating all of your games of Halo. 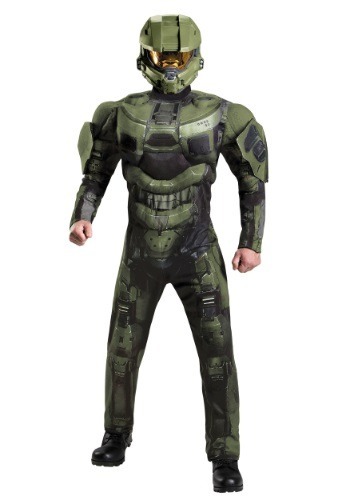 How about this Adult Deluxe Muscle Master Chief Costume? It gives you the look of the SPARTAN soldier, so fighting aliens becomes more than a mere video game. It becomes a way of life. 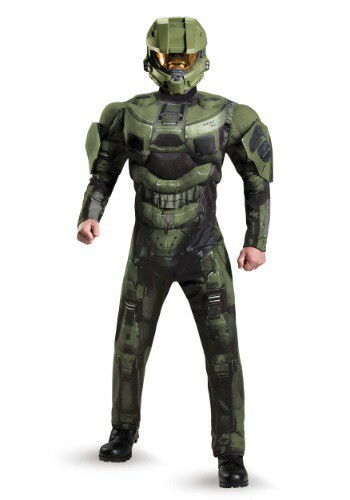 Of course, you could just upgrade your Xbox experience by playing Halo while wearing this costume, but then who will save humanity from all the crazy Covenant baddies who are trying to destroy us? When someone asks your kid what he wants to do when he grows up, what is his answer? If it's, "I want to go into outerspace to fight aliens with big guns," then chances are your kid is a fan of Halo. 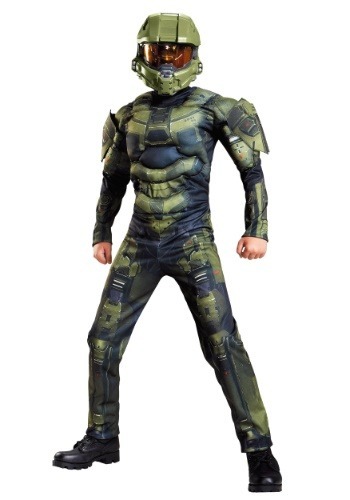 This Boys Master Chief Classic Muscle Costume lets him look like the hero from X-Box video game series, so even though he may not be old enough fight the Covenant, he can still feel like the hero of humanity. The last bastion of defense against the eradication of the human race, Master Chief has a shoot first and ask second kind of attitude against any alien who poses a threat to humanity. Backed by guns, armor and a cybernetic-enhanced body, nothing stops him from completing a mission. ATTENTION CUSTOMERS:This product cannot be shipped in its original box to Australia, Canada, Great Britain, Guadeloupe, Israel, Mexico, New Zealand, Russia or Singapore, Lithuania, Slovenia, South Africa, Taiwan, Thailand or Ukraine. You've probably got your own strategy for playing Halo. Is dual wielding Needlers your style, or maybe you're the guy who has the location of all the rocket launchers memorized on each map? Wait, you're the guy who charges head first with the shotgun. No matter what kind of tactics you use to play Master Chief, it always involves him wearing his Spartan helmet, because you never know what kind of crazy stuff you're going to see while protecting the human race from alien civilizations. Get ready to become a hero of battlefield when you wear this great Blue Spartan costume straight from Halo. This is perfect for fans of the hit Xbox game. Be sure to pick up some of our great gun accessories to complete your look! Legendary Spartan soldier and Covenant exterminator, being Master Chief means that you'll spend most of your time dual wielding SMGs while causing mayhem in enemy ranks. You might even save a noob or two on your missions. 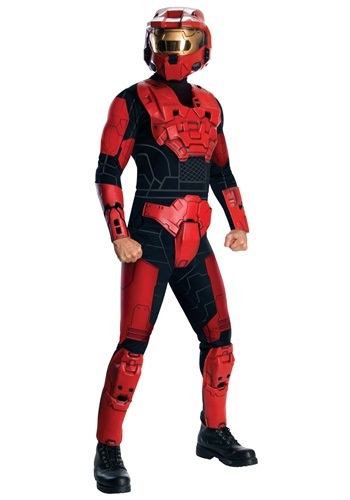 Get ready to hit the battlefield in style when you wear this awesome red Spartan costume. If you play a great deal of Halo then this costume is for you. Join your friends in an epic Halloween group costume of Spartans with this jumpsuit and helmet. Some guys head straight for the shotgun on the map. Other guys go for the rocket launcher. Other, more refined soldiers, go straight for the energy sword. Nothing is quite as satisfying as dicing up your opponent at close range with some alien technology! 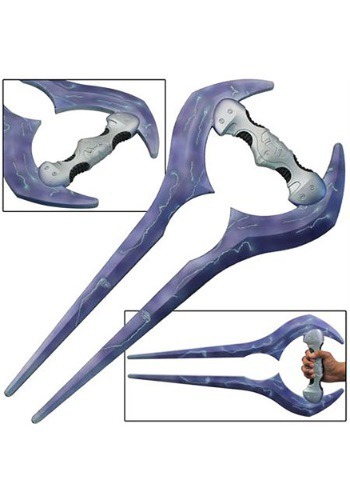 This Halo Forked Foam LARP Sword gives you the classic weapon from the Xbox game, in a form that won't slice up your friends like the real thing. 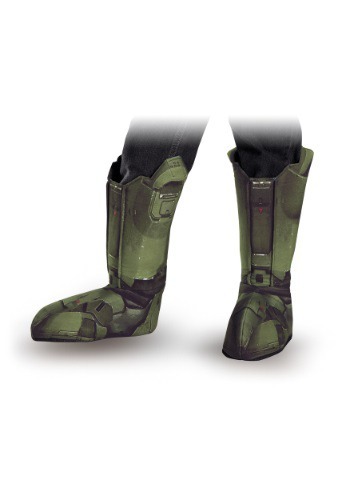 You have some big shoes to fill if you want to be Master Chief from the Halo series. Okay, so maybe these Master Chief Adult Boot Covers are one size fits most, but metaphorically speaking, his role is hare to fill! That means you'd better be ready to use your feet to charge into Covenant territory wielding nothing but a battle rifle. When you have these boot covers, you'll be ready. Think about it. Your hands have done some work on Halo. Controlling Master Chief through all the dangers of all the Xbox games is no easy task and you hands have masterfully hit the x button and the L/R triggers without hesitation. They're ready for the real thing. 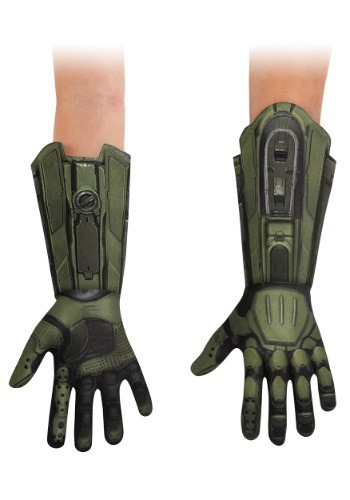 They're ready for these Master Chief Deluxe Adult Gloves! Based on the video game, they give you hands the look of real Spartan, ready to tangle with any member of the Covenant. Are you a veteran of some serious Halo campaigns? Then you're no stranger to the venerable Master Chief! It's time to put down the controller and bring the Chief into the real world with this deluxe plus size costume. You might not have do deal with the Covenant, the Prometheans, or the Flood here in our reality, but there's sure to be plenty of ways that you can help out the cause. Like overseeing the party, you know, making sure there's plenty of dip on the table, and making sure no one sabotages the playlist. Because no matter who's filling his shoes, we think we can agree on one thing—Master Chief does not want to spend the night listening to 1D. A normal day of work for Master Chief is a little different than a day at the office. His day usually includes, driving to work in a Rocket Warthog, dual wielding M6 pistols against enemy Covenant soldiers and destroying alien headquarters with extreme prejudice. Doing all that kind of stuff without a SPARTAN helmet is just an accident waiting to happen, so you'll never see him running into a fight without it. Of course, you'll probably just use it to feel awesome while playing Halo, which is totally fine with us.